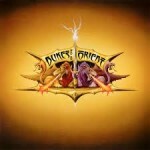 Share the post "Album review: DUKES OF THE ORIENT"
Dukes Of The Orient is centred around vocalist/bassist John Payne and keyboards player Erik Norlander, however they have their origins in Asia featuring John Payne. In that guise John Payne has worked with guitarists Guthrie Govan, Moni Scaria, Bruce Bouillet and Jeff Kollman, all of whom appear on the album on one or more songs, along with drummer Jay Schellen, plus of course Erik Norlander. This album has been in the making for over ten years and it has been worth the wait. Musically there is a lot of Asia in the sound as you’d expect, none more so than on ‘Strange Days’, which recalls the ‘Silent Nation’ album by Asia. A song full of melody and a memorable chorus. It also marks the only song to feature Guthrie Govan on guitar. The guitar playing on ‘Time Waits For No One’ is reminiscent of Steve Howe and it is another song with a big melody and chorus. ‘A Sorrows Crown’ with a big church organ intro, highlights the keyboards wizardry of Erik Norlander who’s playing is a delight to listen to throughout the album. The ten minute epic ‘Give Another Reason’ starts with a lovely piece of acoustic guitar, before developing into a big prog rock workout. A song more in tune with the one album GPS made (that was Guthrie/Payne/Schellen with Spock’s Beard’s Ryo Okumto). This entry was posted in ALBUM REVIEWS, ALBUM REVIEWS (Mobile), All Posts and tagged album, Asia, Dukes of the Orient, Erik Norlander, GPS, John Payne, melodic, prog, review, rock. Bookmark the permalink.